South Beach Street follows the curve of the waterline. There is a strip of greenspace, filled with sabal palms, between the road and the water. One early automobile is driving on the road, and another has pulled off to the left side. 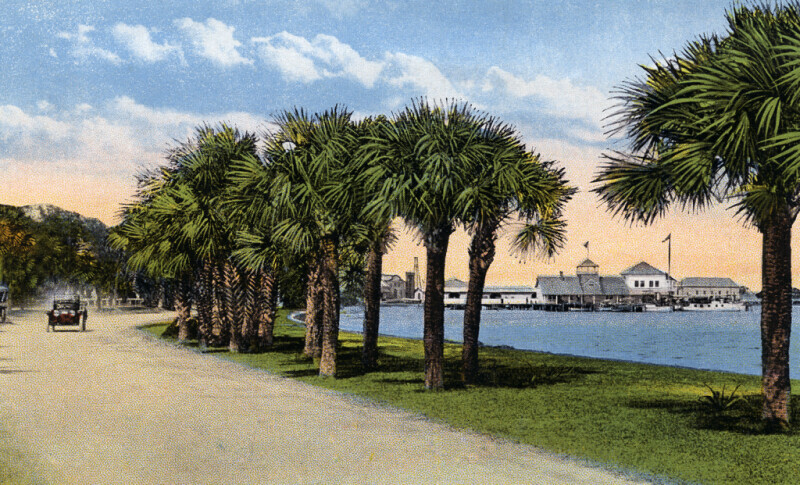 Through a gap in the palm trees, the yacht club can be seen. The club is white, wooden framed structure, with a gray roof. There is a square cupola, or covered observation deck, at the apex of he club's pitched roof. In the far distance, another observation deck can be seen.